A simple online course for brilliant women who always wanted to learn guitar. is an online course for women who want a simple way to play guitar. Whoever lights you up -- honor and emulate her. By the end of this class, you'll know the parts of the guitar, how to hold it, tune it, and use a pick. By the end of this class, you'll know how to play "Big Yellow Taxi" by Joni Mitchell (and a thousand other songs). By the end of this module, you'll know how to play "Fast Car" by Tracy Chapman. By the end of this module, you'll know how to play "Killing Me Softly" by The Fugees. By the end of this module, you'll know how to play "Piece Of My Heart" by Janis Joplin. By the end of this module, you'll know how to play "(You Make Me Feel Like) A Natural Woman" by Carole King. 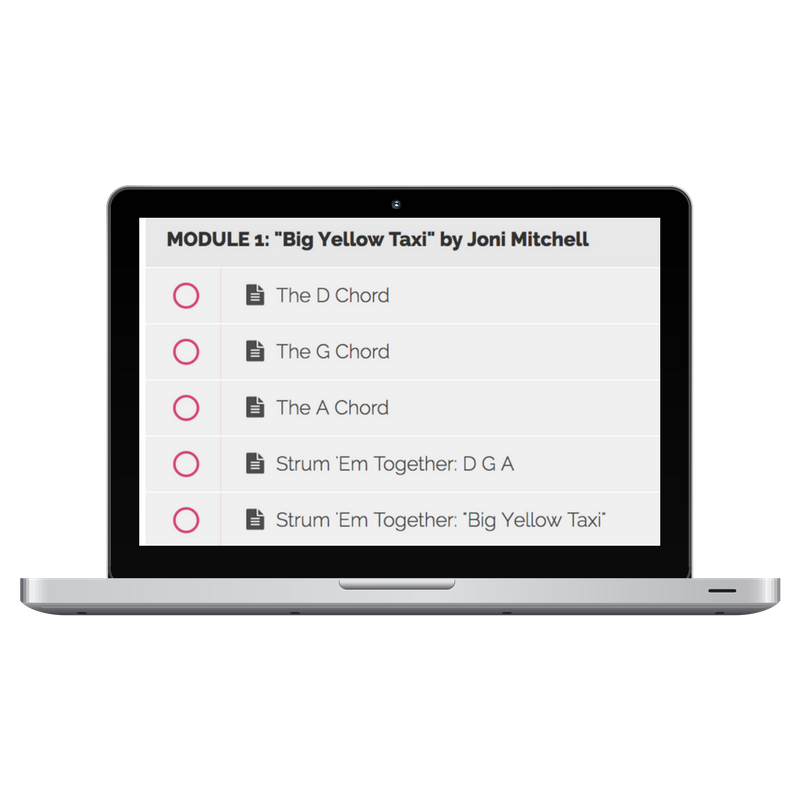 By the end of this bonus module, you'll know how to play an Em pentatonic scale (and a blues scale, double bonus!) that sound really, really good. By the end of this bonus module, you'll know how to fingerpick "Landslide" by Fleetwood Mac. FOR THE FIRST TIME... This is GONNA be easy. Steel String Heroine is self-paced, and designed to *NOT* stress you out. This was created with JOY in mind. No practice requirements, no long time investments. "This program is the best! I was feeling so down, overwhelmed and unseen by previous guitar teachers. Steph got me right away. She saw my music and my soul. I felt super supported and she broke everything down in to digestible bits, making learning super fun. It’s really a special treat to work with her. Not only is she super talented and awesome but she absolutely loves what she does and will give you her absolute all (which is such a gift)." You can emulate my strategies, learn from my pain, copy my techniques... and get yo'self strumming in a matter of days. Do you have a proven plan to EVER make this happen? Join me. We'll do it in a fun few hours together. 4 private lessons from a teacher would cost at least $250. This is less than HALF of that. Due to the nature of this course it is non-refundable! You may transfer it to another person at no additional cost. We trust you to make a wise and thoughtful decision. + When does the course start & finish? The course starts the week of May 16 and never ends! It is a completely self-paced online course - you decide when you start and when you finish. + This seems expensive. Why shouldn't I just watch a YouTube tutorial? You totally can! And... I always say: you get what you pay for. This is pretty much the cost of LESS than 2 private lessons. And when you register, I'll be here to answer ALL your questions. Like, for life! + This course would be a big investment for me. Is it really worth the price? I'll let one of my former students Ayman tell you about what it's like to work with me. He writes, “You’re a songwriter’s hero! Your material is so well prepared and organized. It’s too good to stop here - I want more." In case you might be wondering... the image of Janis Joplin is used with permission!